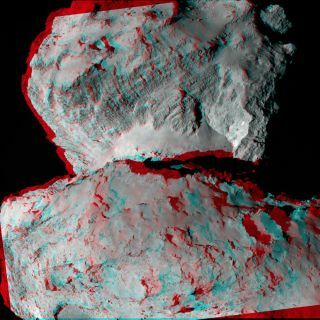 You can view this anaglyph image of comet 67P/Churyumov-Gerasimenko using stereoscopic glasses with red–green/blue filters. Rosetta's OSIRIS narrow-angle camera took the two images combined here on August 7, 2014 from a distance of 65 miles (104 kilometers), separated by 17 minutes. Break out your red and blue 3D glasses. It's time to examine the nooks and crannies of a comet in three dimensions. The European Space Agency's Rosetta probe snapped the two amazing images that were spliced together to create this 3D picture of its target, Comet 67P/Churyumov-Gerasimenko, after arriving at the deep space object last week. The picture of the comet seems to pop off the page when viewed through 3D glasses. Rosetta snapped the two photos on Aug. 7 when the spacecraft was about 65 miles (104 kilometers) away from the comet. You can see a flyover video of the comet on Space.com. The space agency also released the separate images used to create the 3D view. The up-close-and-personal photos show house-sized boulders and seemingly smooth areas on the oddly shaped comet's "head," "neck" and "body." The images aren't just for entertainment. Rosetta's mission controllers are scoping out good places for the Philae lander — another spacecraft currently housed within Rosetta — to touch down on the 2.5-mile-wide (4 km) comet in November. Rosetta's photos have already shown that the comet isn't the usual "potato" shape that many people were expecting it to be, according to ESA. Ground controllers have already started checking out some interesting spots that they could land Philae, but they will choose up to five possible landing sites during a meeting from Aug. 22 to 24. "The physical nature of the site is also an important factor: are there hazards such as large boulders or deep crevasses on the surface?" ESA officials wrote in a mission description. "Is the topography of the landing site suitable for the science experiments?" Data collected by Rosetta's instruments will help determine the best place to land in the months to come, allowing ESA officials to figure out the gravity and rotation of the comet to ensure Philae gets to the surface safely once released. Rosetta has consistently beamed back amazing images of the comet since its arrival at Comet 67P/C-G on August 6. One photo, taken on Aug. 12, shows the comet's weird shape emerging from shadow. The head, neck and body of Comet 67P/C-G appear to emerge from the dark, with craters and craggy peaks adding depth to the image, which was taken when Rosetta was about 64 miles (103 km) from the comet. Another image released by ESA shows the comet as it was seen by Rosetta on Aug.13. The interesting view doesn't show the comet's three parts. Instead, the recent photo shows the underside or top of the comet, which features what looks like a flat area in the middle. The probe will stay in a triangular orbit around the comet for the next few weeks while mission controllers gather more data about the comet's gravity and properties. Rosetta will then move into a closer, circular orbit as it prepares to drop the lander on the surface.